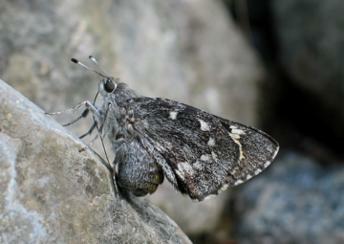 Sleepy Duskywing is a spring flier in the montane oaks. 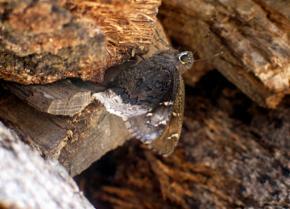 Here one sips mud at the edge of our backyard pond (4 March 2011). 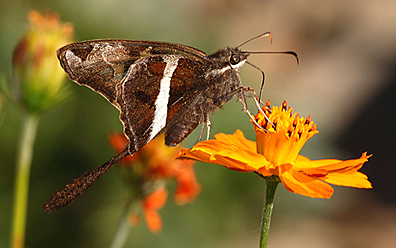 A Dorantes Longtail, one of many species attracted to Cosmos (4 Oct 2005) (L). 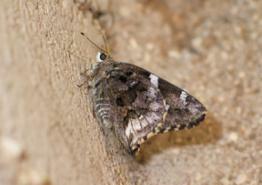 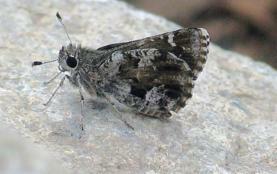 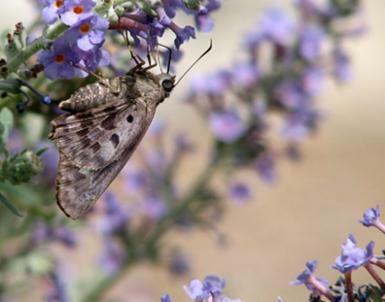 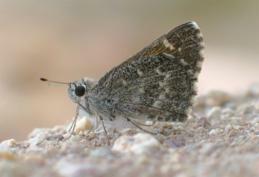 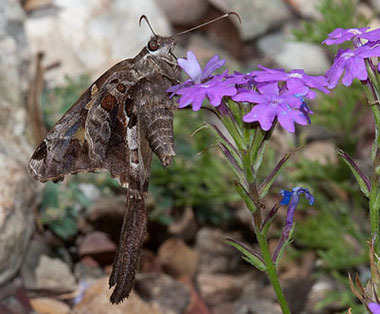 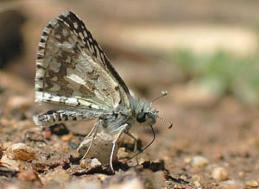 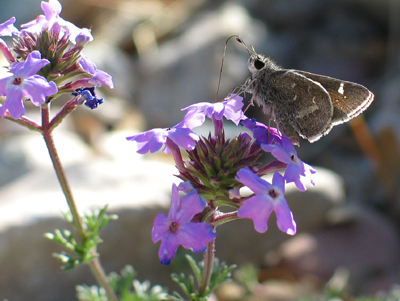 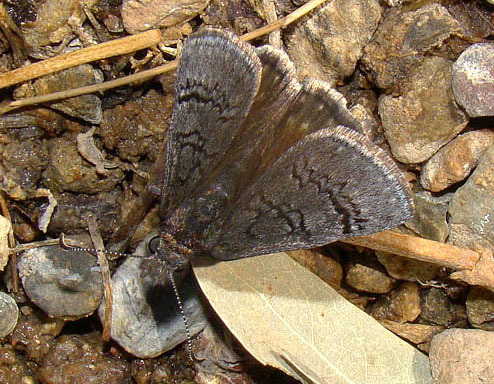 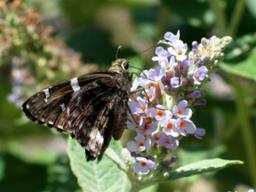 The Zilpa Longtail is a rare Mexican influx species in Arizona. 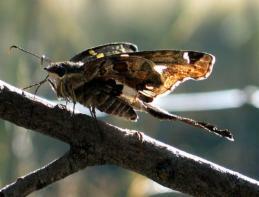 Here one basks on a branch (23 Oct 2005) (Karen LeMay photo) (R). 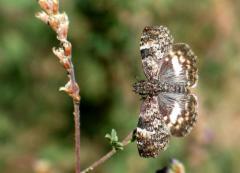 A second Zilpa Longtail was seen in the yard on 4 October 2010. 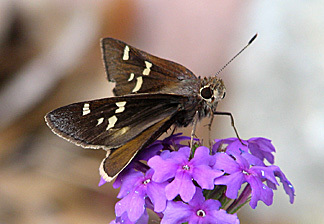 After seven summers, an Erichson's White Skipper finally appeared and became the 110th butterfly for the property (3 October 2010). 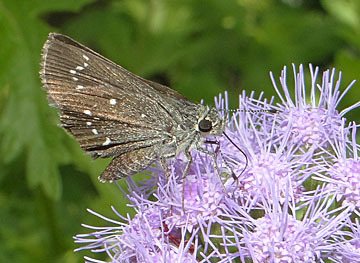 This Brazilian Skipper, the second for the yard, was seen nectaring on the tall spikes of Salvia leucantha (7 October 2010). 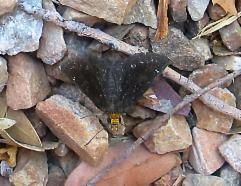 I am not aware of any Canna (its host plant) growing in the neighborhood. 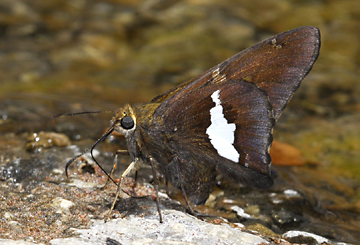 A Silver-spotted Skipper takes a drink at the pond (23 May 2007). 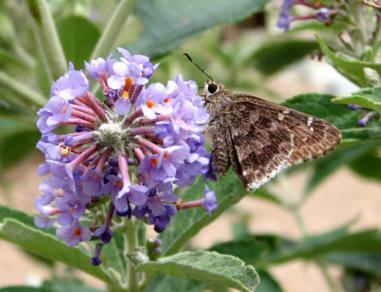 A Carus Skipper nectars on Buddleia (24 July 2006). 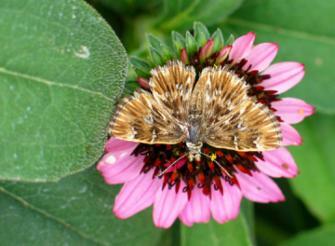 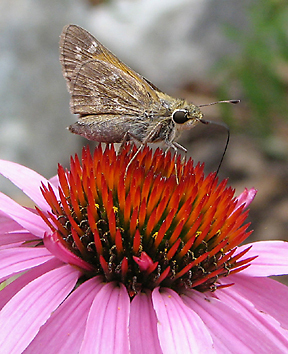 A Pahaska Skipper nectars on aster. 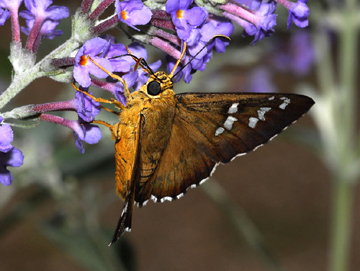 Thanks to Brock and Bailowitz for looking at photos of this skipper. 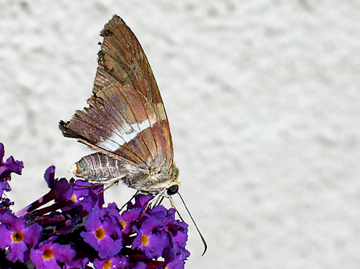 (7 September 2015). 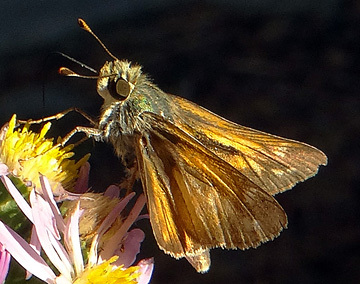 This Elissa Roadside-Skipper (above and below) was found during the local butterfly count and was butterfly #115 for the yard (2 August 2014). 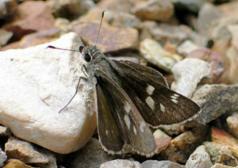 A fresh Deva Skipper basking on a rock (15 May 2006). 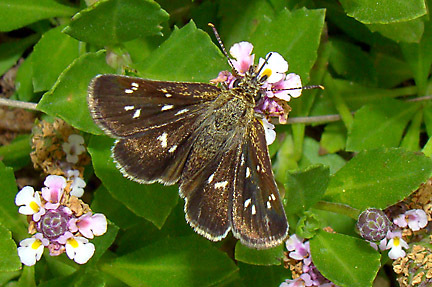 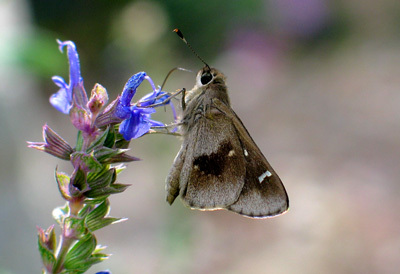 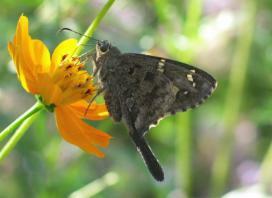 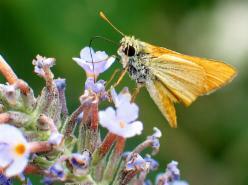 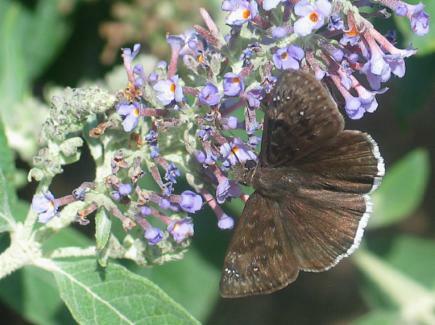 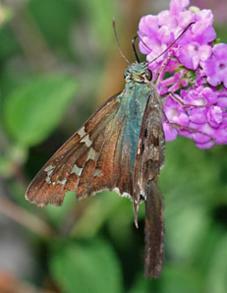 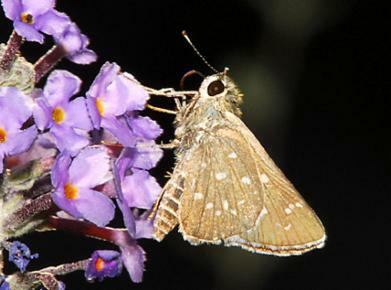 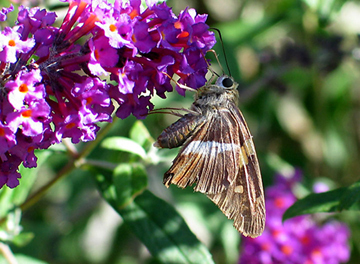 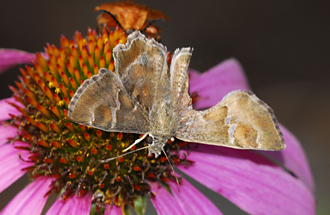 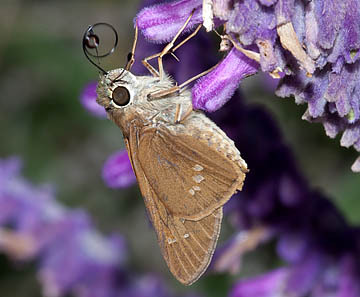 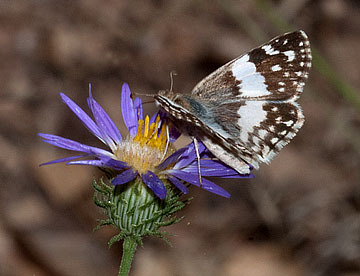 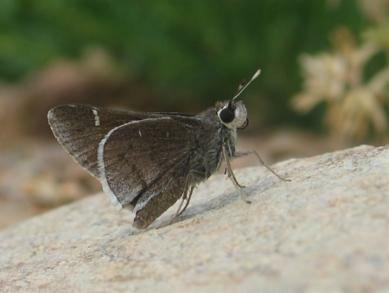 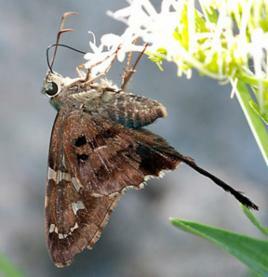 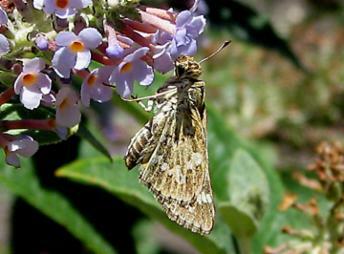 Moon-marked Skipper is similar to Deva Skipper (see above) but flies during later summer. 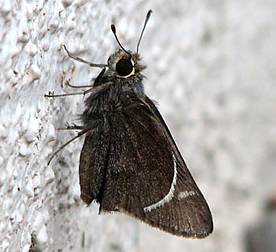 Here one sits on a wall during an afternoon drizzle (7 August 2007). 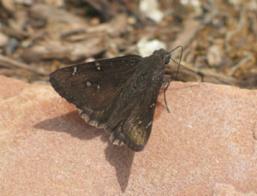 Common Sootywing is one of the most widespread U.S. butterflies. 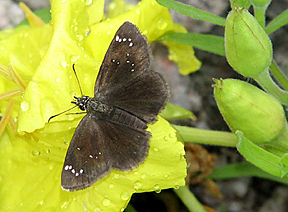 Here, one basks on primrose after an afternoon shower (7 August 2007). 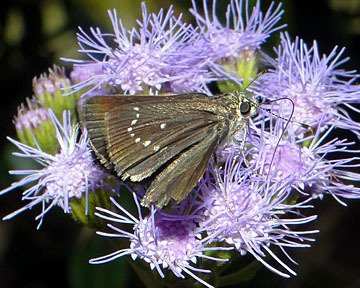 Eufala Skippers occur here in small numbers until at least a week into November. 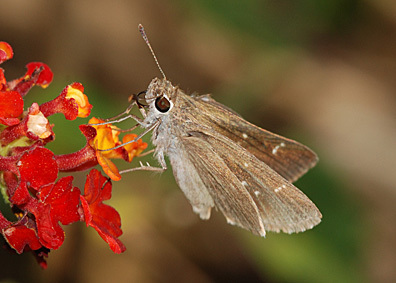 This one nectared on Lantana (28 October 2007). 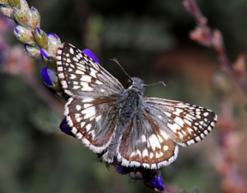 Images may not be reproduced without the Photographer's permission.